The most satisfying peak on the mountain, possibly. Girdlestone sits high and isolated at the south-eastern end of the massif. It has the most peak-like countenance; reasonably steep on all sides and with a range of routes to choose from. 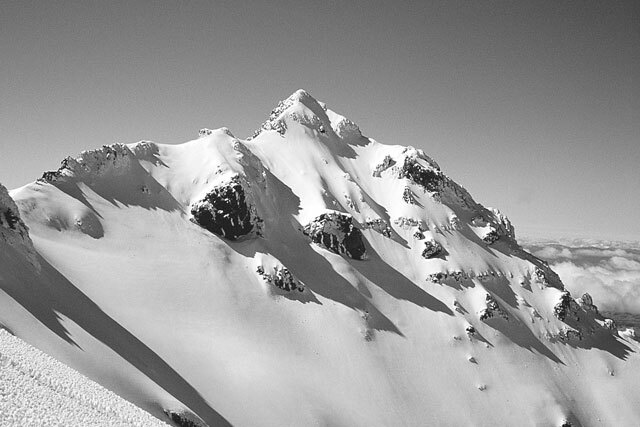 Routes on the west and south sides are best accessed from Turoa skiﬁeld and the Mangaehuehu Glacier. The glacier itself can have some sizeable crevasses in late summer, useful for practising extraction techniques. Routes on the eastern and southern aspects may be more easily reached from Whangaehu Hut, by crossing the col into the Wahianoa between Ringatoto and Tahurangi. 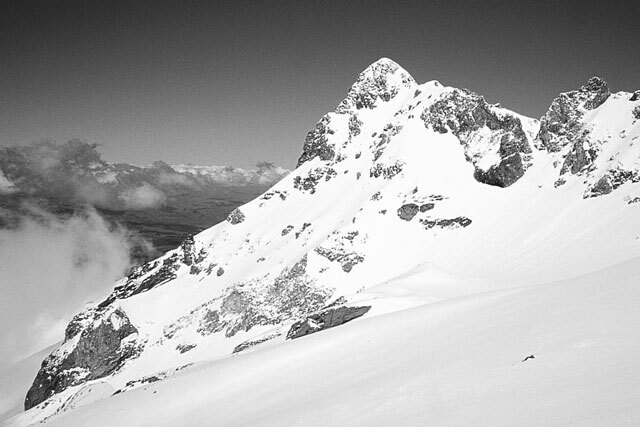 Climb to the col at the head of the Mangaehuehu Glacier. From the col, head along the ridge, usually turning any difficulties on the western side. A nice summer or winter climb. This route wends its way through outcrops up the face above the glacier. A prominent line with no real difficulties. The southern aspects of Girdlestone are a popular choice for simple but satisfying routes, especially for practising pitched climbing. The southwestern aspects are often icier, with more rock outcrops and devious routeﬁnding through gullies and chutes. The more open southern ﬂank, in contrast, has reasonably clear travel especially higher on the peak. A roundabout but straightforward route starts on the eastern side of the face and climbs in a generally clockwise direction to ﬁnish up the Southwest Buttress. Obvious corner in the rock buttress on the South Face of Girdlestone. One 60m Pitch. First up a rock corner with 2 more steps \ corners of 75% ice above. Good rock and ice protection. Descend by traversing 60m towards the SE ridge to gully which may be down climbed. A good summer line on sound rock. There is a spectacular hole (‘The Window’) in the lower ridge. A favourite climb of Horace Holl. Major gully lines head up each side of the South East Face. 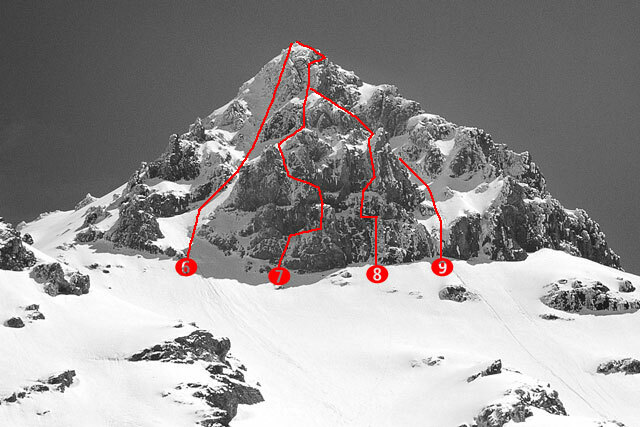 The left-hand gully gives straightforward climbing initially, but conditions steepen near the top. A mixed route on the central buttress of the South East Face. Five pitches. An excellent mixed route on the central buttress of the South East Face. Five pitches. The steep initial step comes and goes, depending on winter snowfalls. The somewhat intimidating buttress that leers up from the base of the Wahianoa Glacier. Has a nice, exposed aspect. Mark Prebble (who later became State Services Commissioner — the country’s chief civil servant) is rumoured to have had an epic here in the 1970s. Climb straight out of the Wahianoa basin, topping out on the flat section of the North Ridge (Voie Normale), just below the summit pyramid. The large gully on Girdlestone’s eastern flank, leading to the low col on the Girdlestone–Tahurangi ridge, and the beginning of the Voie Normale. Note that if you are crossing from the Wahianoa to the Mangaehuehu Glacier, it is better to aim for the high flat point on the ridge at about 2600m, grid ref 313092.